Two researchers from the Technical University of Munich (TUM) recently visited the University of Cambridge’s Division of Trauma and Orthopaedic Surgery (DTOS) in the Department of Surgery, Department of Veterinary Medicine to learn new surgical techniques as part of the STARSTEM project. 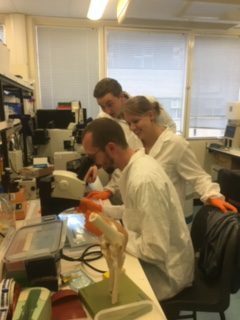 From left to right, TUM researchers Uwe Klemm and Pia Anzenhofer in the laboratory with Will Hotham, PhD student from the University of Cambridge. While in Cambridge, Pia and Uwe also visited The Eagle pub where the double helix structure of DNA was confirmed and tried fish and chips for the first time. Unfortunately, they also got the best of the English weather as it poured rain all day!